Unusual pattern reported July 14, 2003 in the field between Pickled Hill and Woodborough Hill, Alton Barnes, Wiltshire, England. Aerial photograph © 2003 by Lucy Pringle. I decided to drive over to the Woodborough church to park my car and walk the path that would take me to Woodborough Hill. From the top, I would have clear views in all directions to watch the helicopter activity and to see the two formations that had been discovered previously in wheat near farmer Tim Carson’s barns at the base of the hill. One pattern was being called the “bear claw” and another nearby was dubbed the “snake.” I drove to the church parking lot and could hear helicopters in the distance. I walked into the open church to see its stained glass windows. A few minutes later, I walked outside toward my car and was astonished by the sudden loud roar of a helicopter. It was a solid black Apache bristling with all its gun ports and other technologies only about 300 feet above me. The helicopter turned tightly over my head as if observing me and I took photographs of it with my 35mm camera. As the black helicopter flew away with a great roaring sound, I wondered why I, or anyone, would be subjected to such a threatening aerial machine at close range near a church. Soon after, it began to rain hard and on into the night. 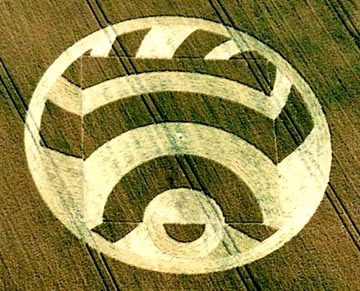 On Sunday, July 27, while many of us were attending the last day of the Glastonbury Symposium, a “snake” pattern was laid down in the same wheat field near the Carson barns not far from the “bear claw.” Walking through that formation on Tuesday, July 29, the wheat plants were so lifeless and laid so flatly and mechanically that the likelihood is that pranksters were responsible. Last night, July 30, Andy Buckley, his friend Hazel, and I climbed to the top of Woodborough Hill for a night watch, given all the helicopter activity. When red Mars rose in the east as large as it’s been in about seventy thousand years (its closest approach will be August 27), we were viewing it through our various cameras and binoculars. In my Sony digital video camera on Super Night Shot, there were two small, blue-white objects in the frame that were pulsing oddly out of sync with each other, almost as if in reaction to each other. None of us understood what the pulsing objects could be. There was no motion, only erratic pulsing. One object would pulse, then the other and so on, alternating for at least fifteen minutes of steady camera viewing. After awhile, the pulsing objects in the frame with Mars disappeared. 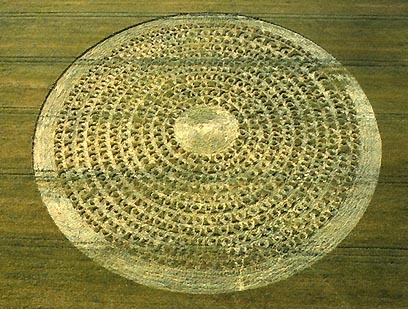 The crop pattern I was most interested in seeing on the ground was the eleven concentric rings of repeating patterns in barley discovered in line with four ancient tumuli behind Cherhill on July 6, 2003. See Earthfiles July report. Known as North Down, there is no easy way to get there. Yesterday, July 30th, researchers David Cayton, Robert Hulse and I walked for about a half hour up hill and down to reach the field. There is one place where you can see the four ancient burial grounds – more than 4,000 years old – in the foreground and the obelisk at the top of Cherhill Down in the background. In my earlier North Down report at Earthfiles, there is a map with a straight line along the tumuli which intersects Silbury Hill. Who were buried in the ancient North Down mounds? What were their relationship to the great stone circles of Avebury and the sacred sites of Windmill Hill and Silbury? And what is the meaning of the “fifth mound” created so perfectly in line with the tumuli out of the July 2003 barley? Even though it had been twenty-four days since the formation was first discovered and after days of heavy summer rains, the barley with its long hairs was still sustained in undulating waves. Throughout the formation, each of the “dots” in aerial photographs separated by vertical arcs, were standing barley surrounded by fluid barley waves. I didn’t want to step forward because the plants are still so springy, alive and make a crunching sound as if any weight breaks them down from their exquisite, transcendant undulations and flows. I touched one of the 12-inch high waves and it felt like a sculpture. I tried to pick up the beautifully combed barley hairs that swirled in the wave, but they were all stuck together as if hairsprayed. Biophysicist W. C. Levengood has long hypothesized that the energy that interacts with the crops in the truly mysterious patterns is a “spinning plasma vortex containing microwave energies.” The microwaves might be responsible for rapid heating that causes water in the growth nodes to burst out creating small holes called “expulsion cavities.” Dozens of barley plants that I examined had expulsion cavities, lengthened and darkened nodes, in addition to the hairsprayed solidity of the barley waves that turned and swirled only at the nodes without any wrinkles, creases or breaks between the nodes. If spinning plasma energies and mysterious small lights are the non-human circlemakers, to date no one knows what the source of those spinning energies might be. It is that mystery which draws some of us back to the fields with the hope that one day, or night, we might see a formation like North Down in the moments of creation. Eleven concentric rings of a repeating pattern laid down in a straight line with four burial mounds At North Down west of Silbury Hill and Avebury reported July 6, 2003. See Earthfiles July 11, 2003. Aerial photograph © 2003 by Steve Alexander. Field Notes from England to be continued.